(CNN) -- An alleged gang member who was on the FBI's Top 10 List of most wanted fugitives and sought in connection with a 2000 attack on two Los Angeles, California, officers was captured in Mexico, authorities said Monday. Emigdio Preciado Jr., believed to be 39, was captured Friday in the hills Yagos, Mexico, according to the FBI. Emigdio Preciado Jr., who is believed to be 39, was captured Friday in the hills near the rural Mexican town of Yagos, the FBI said in a written statement. He had been living there, using the name Regalo Castaneda-Castaneda and working as a fisherman, the agency said. Authorities believe Preciado stepped out of a van and opened fire on two Los Angeles County sheriff's deputies with an assault rifle in September 2000, according to the FBI. Some 21 rounds were fired; one hit a deputy in the head and critically injured him. The deputy has since recovered and returned to duty. The FBI said that although Preciado's identifying tattoos had been surgically removed, Mexican police and FBI agents confirmed his identity through fingerprints at the time of his arrest. Specific details regarding Preciado's capture were not released. But Sal Hernandez, assistant director in charge of the FBI's Los Angeles office, said a reward of $150,000 offered on the FBI Web site would be paid. "The significance of the publicity in this case and the reward offered cannot be understated," Hernandez said, according to the statement. Preciado, a U.S. citizen, is currently in the custody of Mexican federal police, the FBI said. He is expected to be transferred to Mexico City, where extradition proceedings will take place. 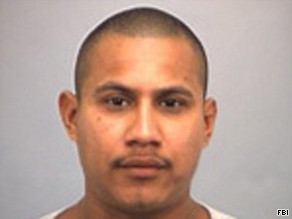 Preciado was sought on a California parole violation at the time of the 2000 shooting, authorities said in the statement, and has an extensive criminal record. He was added to the FBI's Top 10 list in March 2007.